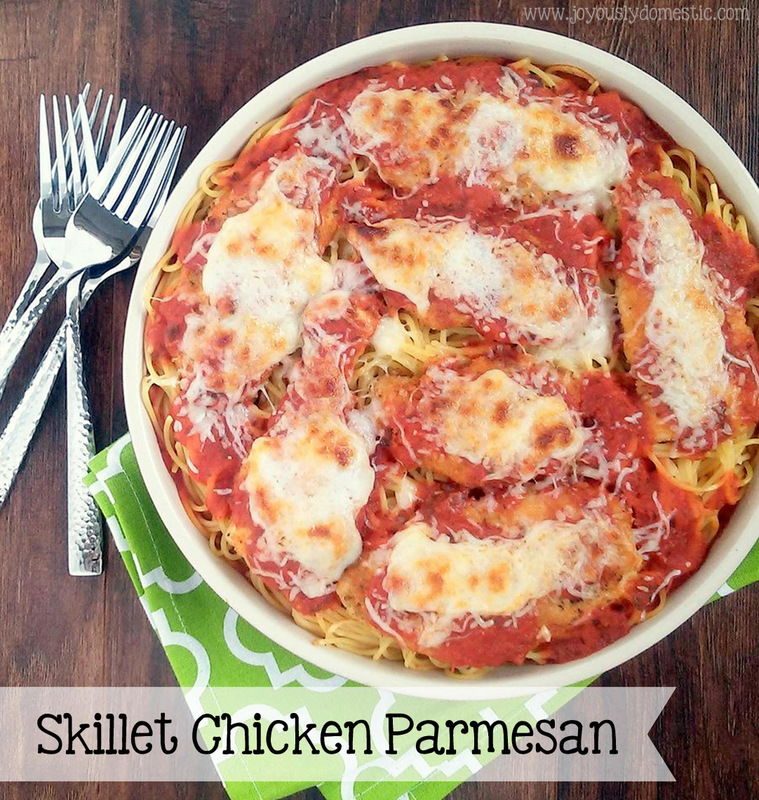 This recipe is a simple variation of traditional Chicken Parmesan. The chicken and sauce can be served with whatever pasta you prefer. Once the pasta is cooked, everything comes together in one pan. We're skipping the heavy breading and deep frying here, so you can kind of consider this a bit of a lighter version ... although there is a bit of butter on the ingredient list and a good amount of cheese. Cheese, glorious cheese. This dish stretches two large chicken breasts into one meal that will serve around four people, so it's pretty economical, too. And, if you wanted to make this even more healthful, you can skip the light coating of breadcrumbs altogether and simply just sauté the chicken breasts (seasoned with the salt, pepper and Italian herbs) in a little olive oil all. This dish went over splendidly in the Joyously Domestic household. It makes for a pretty easy and satisfying weeknight dinner option. The process is pretty straightforward. Boil off the pasta. Lightly coat the chicken with salt, pepper, herbs and breadcrumbs. Sauté the chicken in a bit of olive oil, then remove it from the skillet. Place the cooked pasta down in the skillet, nestle in the chicken, spoon on some good-quality marinara sauce, top with lots of cheese, allow everything to become bubbly in the oven and then grab a fork! Preheat oven to broil or its highest temperature. Start cooking the pasta in salted, boiled water. Cook just until al dente. Meanwhile, drizzle a little olive oil onto the chicken until all sides are coated. Season chicken liberally with salt and pepper on both sides. Sprinkle on the Italian herbs. Preheat a large skillet to medium heat and coat pan with some olive oil - about two tablespoons worth. Sprinkle the breadcrumbs onto both sides of the chicken ... pressing them down to adhere well. Sauté the chicken in skillet until both sides are lightly browned and chicken is just cooked through (about 3 - 4 minutes per side). You may have to do this step in two batches so that you do not crowd the pan. Drain pasta once cooked. 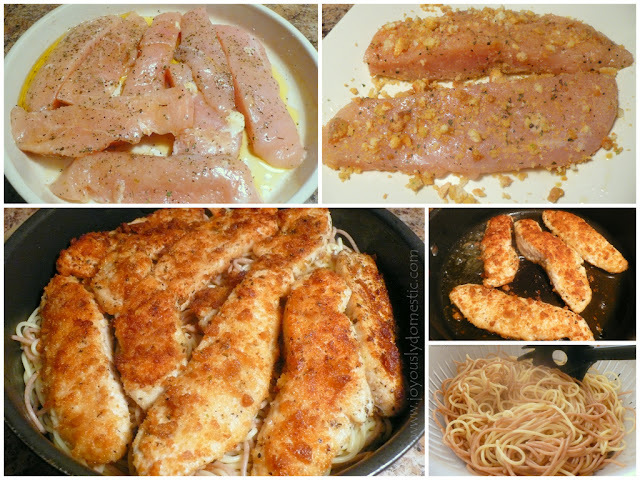 Remove chicken from pan once cooked (set aside on a large plate). Wipe out pan with a paper towel. Place about a fourth of the marinara into the same pan that the chicken was cooked in. (A medium sized baking dish can, also, be used.) Spread to evenly coat bottom of pan. Pour the cooked pasta into the pan. Nestle the chicken onto the pasta. Spoon the remaining sauce over the chicken. Top the chicken with "piles" of the Parmesan cheese and the mozzarella/provolone cheese(s). Dot the 2 tablespoons of butter (cut into small cubes) evenly on top of the cheese piles. Broil about 4 - 6 minutes or until cheese is melted and everything is nice and bubbly. Garnish with fresh herbs, if desired. Serve immediately. NOTE: I often crush up store-bought croutons (usually the garlic and cheese flavor) to use as breadcrumbs. You get a ton of flavor, a crunchier texture and a little bit of a chunkier crumb. Is there a secret to getting the breadcrumbs not to stick to the pan. I hardly had any on the chicken by the time it was done cooking. From my experience, I make sure the pan and oil is at the right temp ... and, I really press the breadcrumbs into the chicken firmly prior to placing into the pan. Also, don't mess with the chicken once you put it into the pan ... allow it to brown up on the first side before trying to move it or flip it, etc. It helps "set" the breading. Thank you for your feedback. Again, I'm sorry that you had issues with the recipe and I hope things are remedied should you try the recipe again in the future. How could you cut this recipe in half? I love this recipe! I have been coming back to it for months and months--my husband's absolute favorite! So glad to hear that. Thank you for coming by with your feedback! Wow I've made this three times it turned out great each time I made it my daughter and I love it !!!!!!!!!!!!! This was AMAZING!!!! My husband is pretty picky, and he said it's one of his all-time favorite dishes! Thanks for sharing.